A case study to promote basic understanding of wildlife habitat modeling for students based on open source data. Challenged with the task of GIS based modeling for the first time, a working group of undergraduate forestry students of the University for Sustainable Development Eberswalde (HNEE) conducted literature research for habitat suitability and behavior of the Eurasian Lynx (Lynx lynx). In the module ‘Applied GIS in Natural Resource Management’, under the guidance of Prof. Mund, the students quickly discovered the subject’s complexity, especially within regard to the adaptability of species to changing environments. 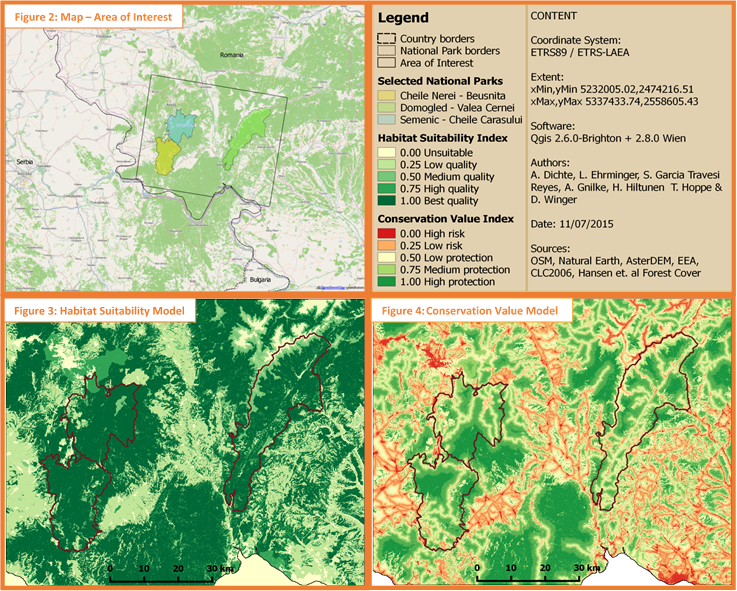 With limited research published in English about lynx habitat on the Romanian side, we continued the project based on only freely available data sets and open-source software, aiming to establish conceptual knowledge of habitat modeling, strengthening skills on widely applied QGIS tools and to create a basic expert model in the process. All collected data was processed with QGIS 2.6 and 2.8, projected into ETRS89 / ETRS-LAEA and stored according to the INSPIRE directive to meet EU standards. An overall discrete index of weights was defined and applied to all input data. Looking at the final output (Figure 3), a plausible first potential habitat analysis appeared to be successful, yet more importantly, basic modeling itself turned out to be less difficult than initially expected. Our choice to add a sub-model for hunter accessibility allowed us to implement another dimension in terms of habitat risk assessment, which can be simply nested into the already existing scenario and used to determine protection necessities under aspects of e.g. infrastructure development. However, some crucial habitat information, such as forest structure (our highest habitat suitability) cannot be derived by available data sets and in combination with the complex species behavior, the result must therefore be understood as basic and incomplete. Additional factors not implemented at this stage are road mortality, terrain roughness and detailed prey occurrence. Besides its open source, free available character, QGIS software has been the subject of major developments in recent years. We made very positive experience with the integration of the tool box, allowing the use of various GRASS and SAGA tools, even for inexperienced users. No compatibility issues occurred despite changing frequently between different versions and the general absence of administrative restrictions can be a powerful advantage when working intuitively with data sets. We are looking forward seeing further improvements, especially in regards to the integrated model builder. Kaczensky, P., Chapron, G.,von Avrx, M., Huber, D., Andrén, H. & Linnell, J. (December 2012): Status, management and distribution of large carnivores in Europe. Document European Commission. Schadt, S., Revilla, E., Wiegand, T., Knauer, F., Kaczensky, P., Breitenmoser, U., Bufka, L., Cerveny, J., Koubek, P., Huber, T., Stanisa, C. & Trepl, L. (2002): Assessing the suitability of central European landscapes for the reintroduction of Eurasian lynx. Article Journal of Applied Ecology. Salvatori, V. (2004): Conservation areas for large carnivores in the Carpathian Mountains. PhD Thesis. Podgórski, T., Schmidt, K., Kowalczyk, R. & Gulczyñska, A. (2008): Microhabitat selection by Eurasian lynx and its implications for species conservation. Acta Theriologica 53: 97–110. Boutros, D. (March 2002): Characterization and assessment of suitability of Eurasian lynx (Lynx lynx) den sites. KORA Report No. 12e, Diploma thesis. Angela Dichte, Luca Ehrminger, Silvana Garcia Travesi Reyes, Tobias Hoppe and David Winger are fourth semester students of the study program International Forest Ecosystem Management B.Sc., Anne Gnilke respectively German Forestry and Henri Hiltunen is an exchange student from Mikkeli University of Applied Sciences, Finland. Prof. Mund is lecturing GIS and Remote Sensing at HNE Eberswalde since 2010 and provided guidance and technical support to the project. Please contact Luca.Ehrminger(at)hnee.de, David.Winger(at)hnee.de, or Prof.Dr.Jan-Peter Mund: Jan-Peter.Mund(at)hnee.de for further information.